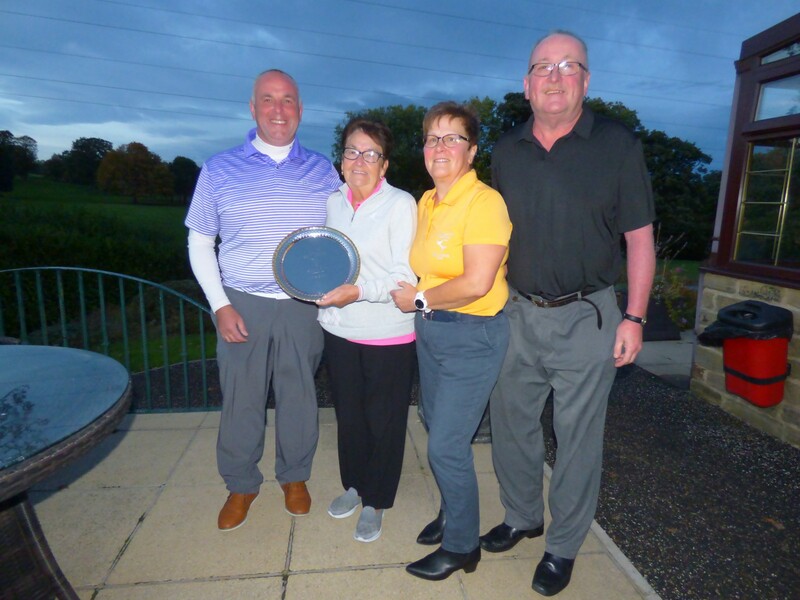 The Horrocks Salver was played for yesterday at Crow Nest Park Golf Club, an annual mixed competition where players may choose their partners to play in Greensomes Stableford. Twenty couples enthusiastically took to the course in fine blustery early autumnal conditions. The winning couple was mother and son duo and past Captains Pam Hollingworth and Dean Wilson. From 9/10ths handicap of 23 and 4 respectively Pam and Dean won with 41 Stableford points. On countback also with 41 points was last years winning team Mike and Gwyn Greenberry. The photo shows from left to right the winners Dean Wilson & Pam Hollingworth, Lady Captain Barbara Horrocks & Peter Horrocks who first presented the trophy to the ladies section in 2004 in Barbara’s previous captaincy year.